A lot of the time, all it takes to make an interesting game is to tweak an existing formula or to just mesh two separate mechanics and concepts together. Case in point, Aegis Defenders, a lovely looking homage to the 16-bit era consoles that's also a co-operative tower defense game. 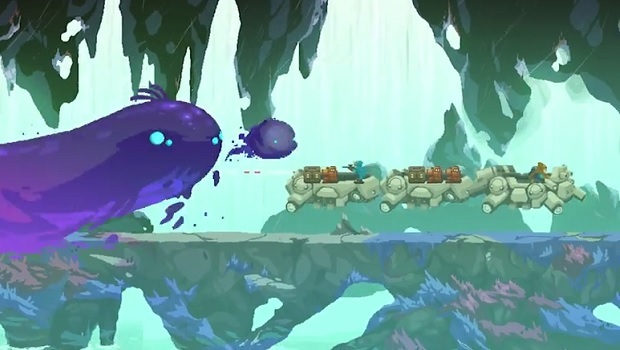 Watching the trailer above shows the team at studio GUTS has got a real feel for classic sprite art and animation; check that big slime monster towards the end of the trailer for proof of that. The game stars Bart and his grand-daughter Clu, who are searching for a powerful weapon called the Aegis, that they hope will save their peaceful village from an invading empire. The game is planned for a release on PC, Mac, and iOS devices if developer GUTS Department can raise $65,000 in the next 34 days.